Baby teeth (otherwise known as primary or deciduous teeth) are generally considered an afterthought. They’re viewed as a temporary and unimportant stage on the way to permanent teeth. As a result of those opinions, the true value and necessity of appropriate dental hygiene and care during the baby teeth stage is frequently neglected. In reality, there’s a host of reasons why you shouldn’t underestimate the importance of baby teeth. Baby teeth have obvious benefits, such as allowing infants to consume solid food. But did you know just how important baby teeth are to a child’s development? So, it’s clear that healthy baby teeth aren’t just about being able to eat real food – they’re an essential prerequisite to the healthy development of any child. There are a few common misconceptions which surround baby teeth. One misconception is that the baby teeth period is relatively short. This is untrue. 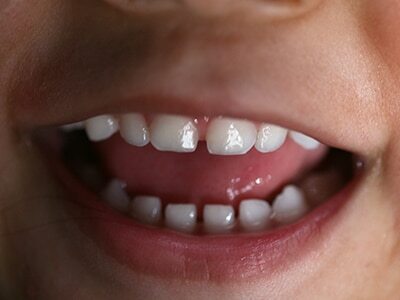 It takes roughly three years for a child’s full set of 20 teeth to erupt. It’s a busy time in your child’s life, and a lot can happen to their teeth in that time, so there’s a lot to expect. Another common myth is that baby teeth can’t be affected by the problems of adult teeth. Not so. Baby teeth are just as susceptible as adults to common problems like cavities, tooth decay and other infections. The last myth is that all baby teeth do erupt. In fact, it’s perfectly natural and common for some baby teeth to never erupt at all. This is known as ‘agenisis’. So, knowing that the baby teething period is actually quite long, and considering the fact that they can be affected by the same tooth problems as adults – if they erupt at all – the necessity of appropriate baby teeth care becomes quite apparent. Up until very recently, the importance of baby teeth (and keeping them in good health) has been consistently underestimated both in dentistry and in the wider public. They are indeed temporary, but the impact they have far outlasts them. If baby teeth aren’t properly cared for, with early dental appointments and check-ups before the age of three years old, the negative consequences can be intensely long-lasting. Just like your child, baby teeth are small, fragile things, which also don’t take long to grow up! They’re one of the true starting points on a baby’s development into childhood. Allowing them to consume a wider variety of foods, which pack more extensive nutritional profiles and benefits; letting them learn to smile; helping them speak, and communicate with the world around them; we ought to being paying more attention to baby teeth. Get in touch with dhealth Dentistry. Our expert team of paediatric dentists know exactly how to keep your children’s baby teeth in tip-top shape; and have the solutions to any dental issues your child may encounter.